A digital barometric pressure sensor for precise measurements of altitude and temperature. Sensor output is digital - either to SPI or I2C. It differs according to the type of fitted sensor. The module is designed to be screwed to the base. The screws can be broken off, so the PCB can be glued directly to a flat surface, decreasing the weight and space requirements. You can see an example of this solution in Experimental construction of Unmanned Aerial vehicle construction. 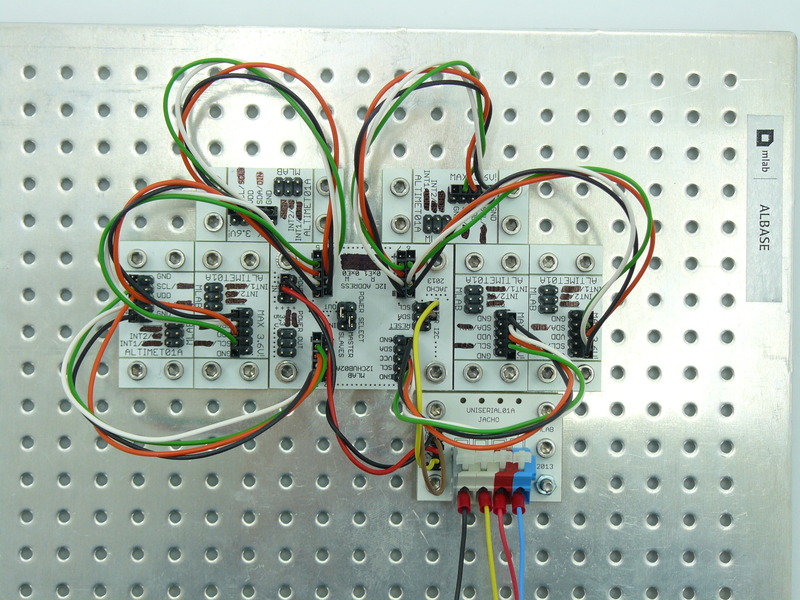 MPL115A1 - SPI interface, power supply up to 5V. MPL3115A2 - I2C interface with vertical pressure resolution 30cm and maximal power supply 3.6 V. This IO does not have SHDN signal and therefore there has to be a jumper fitted to module. MLAB documentation contains examples of connections for microcontrolers Computers with ARM architecture in MLAB brick system, PIC and AVR. 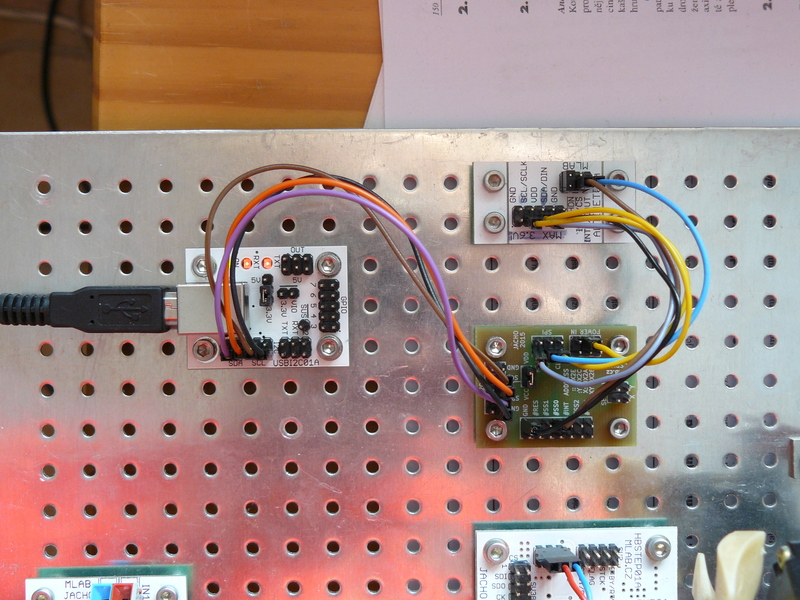 Furthermore, both types of sensors (with I²C or SPI interface) can be read directly from the computer using a Python library pymlab and conversion modules USBI2C and I2CSPI. When measuring the parameters of MPL3115A2 during the ABL01A project, we found out that the pressure measurements were functional at least up to 16 km (approximately 10kPa), a much better result than the parameter stated in the catalogue list. On the other hand, the internal pressure atmospheric model is only usable up to 10 km of altitude - in higher altitudes it experiences considerable inaccuracies. The realisation of a testing system for MPL3115A2 sensor uses I2CHUB02A module, that enables a testing of more sensors at once. Sensors are placed together in a vacuum bell with controlled pressure and the pressure measurements are (together with temperature measurements) read by I²C bus. At the same time, a pressure measured by a reference measuring device DPI 145 is read by the main computer. I2C module version has to be supplied by a stabilised voltage smaller than 3.6 V, otherwise it can be destroyed.